The Great PayPal Fee Debate! Hey Everyone! This is Jenny. I am one of the Facebook group moderators and a contributor to the Homeschool Curriculum Free for Shipping blog. I am also a curriculum donor and a blessed recipient! There is a common debate on the group about how to calculate shipping costs that include the fees from PayPal when using their "Goods and Services" feature to collect shipping monies. 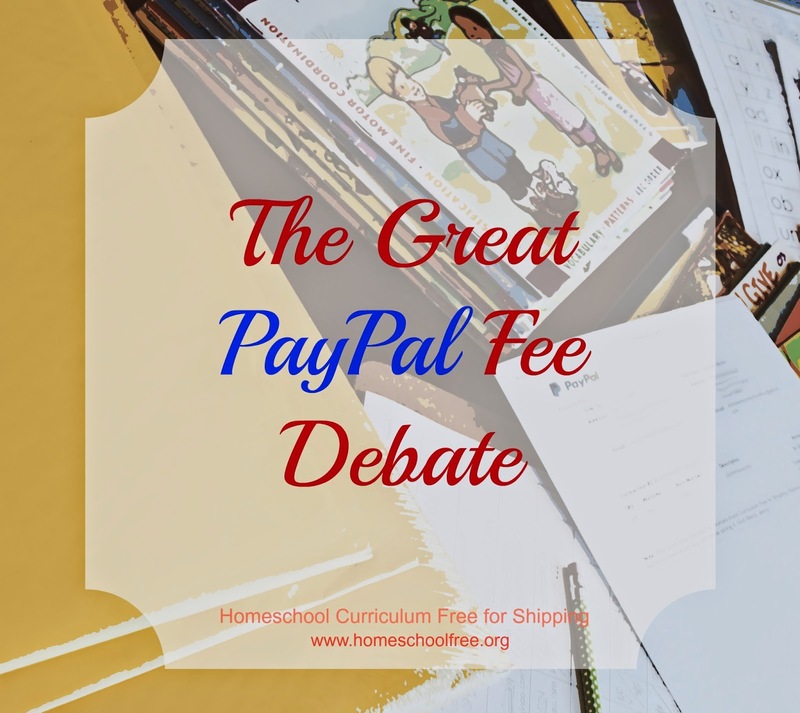 The "official" stance of Homeschool Curriculum Free for Shipping is NOT to ask for reimbursement of Paypal's fees when you request money from another member. It is against Paypal's policies, and we seek to support Paypal and their rules. First I want to say that I recently spoke with a customer service representative with PayPal to ask specifically what the best procedure for collecting shipping monies through PayPal is. I was told that they highly recommend using the "Goods and Services" feature, not the "Friends and Family" feature. Collecting the shipping costs via the "Goods and Services" feature protects both parties involved in the transaction from any issues that may arise. The CSR also said that if you constantly receive monies via the "Friends and Family" feature, your account could be "flagged" for inappropriate use. (For this reason, anytime you donate any money to the organization, be sure to use our "donate" button, found here). So on to the debate, is it possible to calculate the PayPal fees in to your shipping cost requests? PayPal calculates their fees at a 2.9% rate + $.30 for the amount that you receive. It would be difficult to include those fees in your shipping costs because if you include, say $.39 to cover the PayPal fees to a $4.00 shipping cost, then you are going to be paying 2.9% +$.30 on $4.39 instead of paying 2.9% +$.30 on $4.00. So you are actually going to be paying more fees when you try to add it in to the initial cost. I want to share with you a story of my experience so far on the Homeschool Curriculum Free for Shipping Facebook group. Last week I sent out 6 packages of books. I asked for a total of $25.00 for shipping/handling costs. However, after the PayPal fees, I received a total of only $22.47 for the shipping costs on all 6 packages.When I took them to the post office it cost $19.02 to ship them. After figuring in the $6.00 for the cost of packaging, my total cost was $25.02. So my personal out-of-pocket expense for shipping 6 packages was $2.55. Some of you members may not want to or may not be able to incur those out-of-pocket expenses, I completely understand, I am not always in the position to do so either. This week, I am ok with it (and will be from now on)…Why? Because this week, I am receiving a book that is on my wish list and the donor is generously paying the shipping too! So that $2.55 out of my pocket last week, was given back to me this week.